20 A None No Power Seat 20 A is a standard Economy Class bulkhead seat and while some find space slightly restricted, others enjoy that there is no one in front of you. The tray table is in the armrest, making the armrest immovable and slightly reducing seat width. There is no floor storage for during take-off and landing. The proximity of the galley and lavatory may be bothersome. This seat usually cannot be secured until check-in unless you will be traveling with an infant. 20 C None No Power Seat 20 C is a standard Economy Class bulkhead seat and while some find space slightly restricted, others enjoy that there is no one in front of you. The tray table is in the armrest, making the armrest immovable and slightly reducing seat width. There is no floor storage for during take-off and landing. The proximity of the galley and lavatory may be bothersome. This seat usually cannot be secured until check-in unless you will be traveling with an infant. 20 D None No Power Seat 20 D is a standard Economy Class bulkhead seat and while some find space slightly restricted, others enjoy that there is no one in front of you. The tray table is in the armrest, making the armrest immovable and slightly reducing seat width. There is no floor storage for during take-off and landing. The proximity of the galley and lavatory may be bothersome. This seat usually cannot be secured until check-in unless you will be traveling with an infant. 20 E None No Power Seat 20 E is a standard Economy Class bulkhead seat and while some find space slightly restricted, others enjoy that there is no one in front of you. The tray table is in the armrest, making the armrest immovable and slightly reducing seat width. There is no floor storage for during take-off and landing. The proximity of the galley and lavatory may be bothersome. This seat usually cannot be secured until check-in unless you will be traveling with an infant. 20 F None No Power Seat 20 F is a standard Economy Class bulkhead seat and while some find space slightly restricted, others enjoy that there is no one in front of you. The tray table is in the armrest, making the armrest immovable and slightly reducing seat width. There is no floor storage for during take-off and landing. The proximity of the galley and lavatory may be bothersome. This seat usually cannot be secured until check-in unless you will be traveling with an infant. 20 G None No Power Seat 20 G is a standard Economy Class bulkhead seat and while some find space slightly restricted, others enjoy that there is no one in front of you. The tray table is in the armrest, making the armrest immovable and slightly reducing seat width. There is no floor storage for during take-off and landing. The proximity of the galley and lavatory may be bothersome. This seat usually cannot be secured until check-in unless you will be traveling with an infant. 20 H None No Power Seat 20 H is a standard Economy Class bulkhead seat and while some find space slightly restricted, others enjoy that there is no one in front of you. The tray table is in the armrest, making the armrest immovable and slightly reducing seat width. There is no floor storage for during take-off and landing. The proximity of the galley and lavatory may be bothersome. This seat usually cannot be secured until check-in unless you will be traveling with an infant. 20 K None No Power Seat 20 K is a standard Economy Class bulkhead seat and while some find space slightly restricted, others enjoy that there is no one in front of you. The tray table is in the armrest, making the armrest immovable and slightly reducing seat width. There is no floor storage for during take-off and landing. The proximity of the galley and lavatory may be bothersome. This seat usually cannot be secured until check-in unless you will be traveling with an infant. 21 C None No Power Seat 21 C is a standard Economy Class seat, although foot room and underseat storage space is limited due to the presence of an entertainment equipment box. 21 D None No Power Seat 21 D is a standard Economy Class seat, although foot room and underseat storage space is limited due to the presence of an entertainment equipment box. 21 G None No Power Seat 21 G is a standard Economy Class seat, although foot room and underseat storage space is limited due to the presence of an entertainment equipment box. 21 H None No Power Seat 21 H is a standard Economy Class seat, although foot room and underseat storage space is limited due to the presence of an entertainment equipment box. 22 C None No Power Seat 22 C is a standard Economy Class seat, although foot room and underseat storage space is limited due to the presence of an entertainment equipment box. 22 D None No Power Seat 22 D is a standard Economy Class seat, although foot room and underseat storage space is limited due to the presence of an entertainment equipment box. 22 G None No Power Seat 22 G is a standard Economy Class seat, although foot room and underseat storage space is limited due to the presence of an entertainment equipment box. 22 H None No Power Seat 22 H is a standard Economy Class seat, although foot room and underseat storage space is limited due to the presence of an entertainment equipment box. 23 A None No Power Seat 23 A does not have a window in this row. 23 C None No Power Seat 23 C is a standard Economy Class seat, although foot room and underseat storage space is limited due to the presence of an entertainment equipment box. 23 D None No Power Seat 23 D is a standard Economy Class seat, although foot room and underseat storage space is limited due to the presence of an entertainment equipment box. 23 G None No Power Seat 23 G is a standard Economy Class seat, although foot room and underseat storage space is limited due to the presence of an entertainment equipment box. 23 H None No Power Seat 23 H is a standard Economy Class seat, although foot room and underseat storage space is limited due to the presence of an entertainment equipment box. 23 K None No Power Seat 23 K does not have a window in this row. 24 C None No Power Seat 24 C is a standard Economy Class seat, although foot room and underseat storage space is limited due to the presence of an entertainment equipment box. 24 D None No Power Seat 24 D is a standard Economy Class seat, although foot room and underseat storage space is limited due to the presence of an entertainment equipment box. 24 G None No Power Seat 24 G is a standard Economy Class seat, although foot room and underseat storage space is limited due to the presence of an entertainment equipment box. 24 H None No Power Seat 24 H is a standard Economy Class seat, although foot room and underseat storage space is limited due to the presence of an entertainment equipment box. 25 C None No Power Seat 25 C is a standard Economy Class seat, although foot room and underseat storage space is limited due to the presence of an entertainment equipment box. 25 D None No Power Seat 25 D is a standard Economy Class seat, although foot room and underseat storage space is limited due to the presence of an entertainment equipment box. 25 G None No Power Seat 25 G is a standard Economy Class seat, although foot room and underseat storage space is limited due to the presence of an entertainment equipment box. 25 H None No Power Seat 25 H is a standard Economy Class seat, although foot room and underseat storage space is limited due to the presence of an entertainment equipment box. 26 C None No Power Seat 26 C is a standard Economy Class seat, although foot room and underseat storage space is limited due to the presence of an entertainment equipment box. 26 D None No Power Seat 26 D is a standard Economy Class seat, although foot room and underseat storage space is limited due to the presence of an entertainment equipment box. 26 G None No Power Seat 26 G is a standard Economy Class seat, although foot room and underseat storage space is limited due to the presence of an entertainment equipment box. 27 C None No Power Seat 27 C is a standard Economy Class seat, although foot room and underseat storage space is limited due to the presence of an entertainment equipment box. 27 D None No Power Seat 27 D is a standard Economy Class seat, although foot room and underseat storage space is limited due to the presence of an entertainment equipment box. 27 G None No Power Seat 27 G is a standard Economy Class seat, although foot room and underseat storage space is limited due to the presence of an entertainment equipment box. 27 H None No Power Seat 27 H is a standard Economy Class seat, although foot room and underseat storage space is limited due to the presence of an entertainment equipment box. 28 C None No Power Seat 28 C is a standard Economy Class seat, although foot room and underseat storage space is limited due to the presence of an entertainment equipment box. 28 D None No Power Seat 28 D is a standard Economy Class seat, although foot room and underseat storage space is limited due to the presence of an entertainment equipment box. 28 G None No Power Seat 28 G is a standard Economy Class seat, although foot room and underseat storage space is limited due to the presence of an entertainment equipment box. 28 H None No Power Seat 28 H is a standard Economy Class seat, although foot room and underseat storage space is limited due to the presence of an entertainment equipment box. 29 C None No Power Seat 29 C is a standard Economy Class seat, although foot room and underseat storage space is limited due to the presence of an entertainment equipment box. 29 D None No Power Seat 29 D is a standard Economy Class seat, although foot room and underseat storage space is limited due to the presence of an entertainment equipment box. 29 G None No Power Seat 29 G is a standard Economy Class seat, although foot room and underseat storage space is limited due to the presence of an entertainment equipment box. 29 H None No Power Seat 29 H is a standard Economy Class seat, although foot room and underseat storage space is limited due to the presence of an entertainment equipment box. 30 C None No Power Seat 30 C is a standard Economy Class seat, although foot room and underseat storage space is limited due to the presence of an entertainment equipment box. 30 D None No Power Seat 30 D is a standard Economy Class seat, although foot room and underseat storage space is limited due to the presence of an entertainment equipment box. 30 G None No Power Seat 30 G is a standard Economy Class seat, although foot room and underseat storage space is limited due to the presence of an entertainment equipment box. 30 H None No Power Seat 30 H is a standard Economy Class seat, although foot room and underseat storage space is limited due to the presence of an entertainment equipment box. 31 C None No Power Seat 31 C is a standard Economy Class seat, although foot room and underseat storage space is limited due to the presence of an entertainment equipment box. 31 D None No Power Seat 31 D is a standard Economy Class seat, although foot room and underseat storage space is limited due to the presence of an entertainment equipment box. 31 G None No Power Seat 31 G is a standard Economy Class seat, although foot room and underseat storage space is limited due to the presence of an entertainment equipment box. 31 H None No Power Seat 31 H is a standard Economy Class seat, although foot room and underseat storage space is limited due to the presence of an entertainment equipment box. 32 C None No Power Seat 32 C is a standard Economy Class seat, although foot room and underseat storage space is limited due to the presence of an entertainment equipment box. 32 D None No Power Seat 32 D is a standard Economy Class seat, although foot room and underseat storage space is limited due to the presence of an entertainment equipment box. 32 G None No Power Seat 32 G is a standard Economy Class seat, although foot room and underseat storage space is limited due to the presence of an entertainment equipment box. 32 H None No Power Seat 32 H is a standard Economy Class seat, although foot room and underseat storage space is limited due to the presence of an entertainment equipment box. 33 C None No Power Seat 33 C is a standard Economy Class seat, although foot room and underseat storage space is limited due to the presence of an entertainment equipment box. 33 D None No Power Seat 33 D is a standard Economy Class seat, although foot room and underseat storage space is limited due to the presence of an entertainment equipment box. 33 G None No Power Seat 33 G is a standard Economy Class seat, although foot room and underseat storage space is limited due to the presence of an entertainment equipment box. 33 H None No Power Seat 33 H is a standard Economy Class seat, although foot room and underseat storage space is limited due to the presence of an entertainment equipment box. 34 C None No Power Seat 34 C is a standard Economy Class seat, although foot room and underseat storage space is limited due to the presence of an entertainment equipment box. 34 D None No Power Seat 34 D is a standard Economy Class seat, although foot room and underseat storage space is limited due to the presence of an entertainment equipment box. 34 G None No Power Seat 34 G is a standard Economy Class seat, although foot room and underseat storage space is limited due to the presence of an entertainment equipment box. 34 H None No Power Seat 34 H is a standard Economy Class seat, although foot room and underseat storage space is limited due to the presence of an entertainment equipment box. 35 A None No Power Seat 35 A may have limited recline due to the wall behind and the proximity of the lavatories can be bothersome. 35 C None No Power Seat 35 C may have limited recline due to the wall behind and the proximity of the lavatories can be bothersome. Foot room and underseat storage space is limited due to the presence of an entertainment equipment box. 35 D None No Power Seat 35 D is a standard Economy Class seat, although foot room and underseat storage space is limited due to the presence of an entertainment equipment box. 35 G None No Power Seat 35 G is a standard Economy Class seat, although foot room and underseat storage space is limited due to the presence of an entertainment equipment box. 35 H None No Power Seat 35 H may have limited recline due to the wall behind and the proximity of the lavatories can be bothersome. Foot room and underseat storage space is limited due to the presence of an entertainment equipment box. 35 K None No Power Seat 35 K may have limited recline due to the wall behind and the proximity of the lavatories can be bothersome. 36 D None No Power Seat 36 D may have limited recline due to the wall behind and the close proximity of the lavatories can be bothersome. Foot room and underseat storage space is limited due to the presence of an entertainment equipment box. 36 E None No Power Seat 36 E may have limited recline due to the wall behind and the close proximity of the lavatories can be bothersome. 36 F None No Power Seat 36 F may have limited recline due to the wall behind and the close proximity of the lavatories can be bothersome. 36 G None No Power Seat 36 G may have limited recline due to the wall behind and the close proximity of the lavatories can be bothersome. Foot room and underseat storage space is limited due to the presence of an entertainment equipment box. 40 A None No Power Seat 40 A has extra space due to the exit row, though some of your legroom is impeded by the slide that protrudes from the exit door and you may have to angle your legs to fully stretch them. The proximity of the lavatories may be bothersome and people often congregate in this area during flight. The tray table is in the armrest, making the armrest immovable and slightly reducing seat width. There is no floor storage for this seat during takeoff and landing. 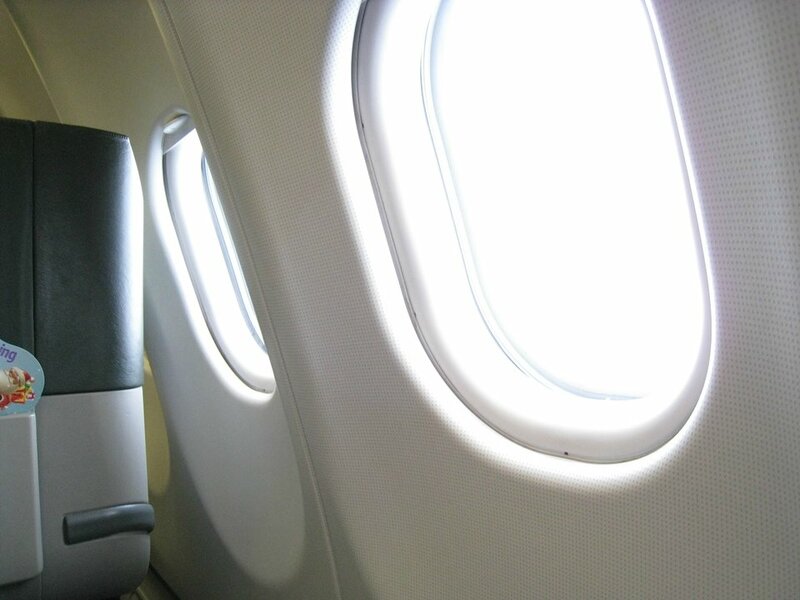 There is no window at this row and it can get cold by the exits during flight. 40 C None No Power Seat 40 C has extra space due to the exit row. The proximity of the lavatories may be bothersome and people often congregate in this area during flight. The flight attendant seat is directly across from this seat and you'll have to share your foot space during take-off and landing. The tray table is in the armrest, making the armrest immovable and slightly reducing seat width. There is no floor storage for this seat during take-off and landing. 40 D None No Power Seat 40 D has some extra legroom due to the position of the bulkhead. Passengers also enjoy that there is no one in front of this seat. The proximity of the lavatories may be bothersome and people often congregate in this area during flight. The tray table is in the armrest, making the armrest immovable and slightly reducing seat width. There is no floor storage for during take-off and landing. This is also a bassinet location and passengers traveling with infants may be seated in this area. This seat usually cannot be secured until check-in unless you will be traveling with an infant. 40 E None No Power Seat 40 E has some extra legroom due to the position of the bulkhead. Passengers also enjoy that there is no one in front of this seat. The proximity of the lavatories may be bothersome and people often congregate in this area during flight. The tray table is in the armrest, making the armrest immovable and slightly reducing seat width. There is no floor storage for during take-off and landing. This is also a bassinet location and passengers traveling with infants may be seated in this area. This seat usually cannot be secured until check-in unless you will be traveling with an infant. 40 F None No Power Seat 40 F has some extra legroom due to the position of the bulkhead. Passengers also enjoy that there is no one in front of this seat. The proximity of the lavatories may be bothersome and people often congregate in this area during flight. The tray table is in the armrest, making the armrest immovable and slightly reducing seat width. There is no floor storage for during take-off and landing. This is also a bassinet location and passengers traveling with infants may be seated in this area. This seat usually cannot be secured until check-in unless you will be traveling with an infant. 40 G None No Power Seat 40 G has some extra legroom due to the position of the bulkhead. Passengers also enjoy that there is no one in front of this seat. The proximity of the lavatories may be bothersome and people often congregate in this area during flight. The tray table is in the armrest, making the armrest immovable and slightly reducing seat width. There is no floor storage for during take-off and landing. This is also a bassinet location and passengers traveling with infants may be seated in this area. This seat usually cannot be secured until check-in unless you will be traveling with an infant. 40 H None No Power Seat 40 H has extra space due to the exit row. The proximity of the lavatories may be bothersome and people often congregate in this area during flight. The flight attendant seat is directly across from this seat and you'll have to share your foot space during take-off and landing. The tray table is in the armrest, making the armrest immovable and slightly reducing seat width. There is no floor storage for this seat during take-off and landing. 40 K None No Power Seat 40 K has extra space due to the exit row, though some of your legroom is impeded by the slide that protrudes from the exit door and you may have to angle your legs to fully stretch them. The proximity of the lavatories may be bothersome and people often congregate in this area during flight. The tray table is in the armrest, making the armrest immovable and slightly reducing seat width. There is no floor storage for this seat during takeoff and landing. There is no window at this row and it can get cold by the exits during flight. 41 C None No Power Seat 41 C is a standard Economy Class seat, although foot room and underseat storage space is limited due to the presence of an entertainment equipment box. 41 D None No Power Seat 41 D is a standard Economy Class seat, although foot room and underseat storage space is limited due to the presence of an entertainment equipment box. 41 G None No Power Seat 41 G is a standard Economy Class seat, although foot room and underseat storage space is limited due to the presence of an entertainment equipment box. 41 H None No Power Seat 41 H is a standard Economy Class seat, although foot room and underseat storage space is limited due to the presence of an entertainment equipment box. 42 C None No Power Seat 42 C is a standard Economy Class seat, although foot room and underseat storage space is limited due to the presence of an entertainment equipment box. 42 D None No Power Seat 42 D is a standard Economy Class seat, although foot room and underseat storage space is limited due to the presence of an entertainment equipment box. 42 G None No Power Seat 42 G is a standard Economy Class seat, although foot room and underseat storage space is limited due to the presence of an entertainment equipment box. 42 H None No Power Seat 42 H is a standard Economy Class seat, although foot room and underseat storage space is limited due to the presence of an entertainment equipment box. 43 C None No Power Seat 43 C is a standard Economy Class seat, although foot room and underseat storage space is limited due to the presence of an entertainment equipment box. 43 D None No Power Seat 43 D is a standard Economy Class seat, although foot room and underseat storage space is limited due to the presence of an entertainment equipment box. 43 G None No Power Seat 43 G is a standard Economy Class seat, although foot room and underseat storage space is limited due to the presence of an entertainment equipment box. 43 H None No Power Seat 43 H is a standard Economy Class seat, although foot room and underseat storage space is limited due to the presence of an entertainment equipment box. 44 C None No Power Seat 44 C is a standard Economy Class seat, although foot room and underseat storage space is limited due to the presence of an entertainment equipment box. 44 D None No Power Seat 44 D is a standard Economy Class seat, although foot room and underseat storage space is limited due to the presence of an entertainment equipment box. 44 G None No Power Seat 44 G is a standard Economy Class seat, although foot room and underseat storage space is limited due to the presence of an entertainment equipment box. 44 H None No Power Seat 44 H is a standard Economy Class seat, although foot room and underseat storage space is limited due to the presence of an entertainment equipment box. 45 C None No Power Seat 45 C is a standard Economy Class seat, although foot room and underseat storage space is limited due to the presence of an entertainment equipment box. 45 D None No Power Seat 45 D is a standard Economy Class seat, although foot room and underseat storage space is limited due to the presence of an entertainment equipment box. 45 G None No Power Seat 45 G is a standard Economy Class seat, although foot room and underseat storage space is limited due to the presence of an entertainment equipment box. 45 H None No Power Seat 45 H is a standard Economy Class seat, although foot room and underseat storage space is limited due to the presence of an entertainment equipment box. 46 C None No Power Seat 46 C is a standard Economy Class seat, although foot room and underseat storage space is limited due to the presence of an entertainment equipment box. 46 D None No Power Seat 46 D is a standard Economy Class seat, although foot room and underseat storage space is limited due to the presence of an entertainment equipment box. 46 G None No Power Seat 46 G is a standard Economy Class seat, although foot room and underseat storage space is limited due to the presence of an entertainment equipment box. 46 H None No Power Seat 46 H is a standard Economy Class seat, although foot room and underseat storage space is limited due to the presence of an entertainment equipment box. 47 C None No Power Seat 47 C is a standard Economy Class seat, although foot room and underseat storage space is limited due to the presence of an entertainment equipment box. 47 D None No Power Seat 47 D is a standard Economy Class seat, although foot room and underseat storage space is limited due to the presence of an entertainment equipment box. 47 G None No Power Seat 47 G is a standard Economy Class seat, although foot room and underseat storage space is limited due to the presence of an entertainment equipment box. 47 H None No Power Seat 47 H is a standard Economy Class seat, although foot room and underseat storage space is limited due to the presence of an entertainment equipment box. 48 C None No Power Seat 48 C is a standard Economy Class seat, although foot room and underseat storage space is limited due to the presence of an entertainment equipment box. 48 D None No Power Seat 48 D juts into the aisle and is often bumped from behind by service carts and other passengers. Foot room and under seat storage space is limited due to the presence of an entertainment equipment box. 48 G None No Power Seat 48 G juts into the aisle and is often bumped from behind by service carts and other passengers. Foot room and under seat storage space is limited due to the presence of an entertainment equipment box. 48 H None No Power Seat 48 H is a standard Economy Class seat, although foot room and underseat storage space is limited due to the presence of an entertainment equipment box. 49 A None No Power Seat 49 A may feel cramped due to the curvature of the aircraft. 49 C None No Power Seat 49 C is a standard Economy Class seat, although foot room and underseat storage space is limited due to the presence of an entertainment equipment box. 49 D None No Power Seat 49 D are a bit awkward because of the transition from four seats across to three seats across. While you have some extra storage space, you'll have to maneuver your legs around the extra seat anchors. 49 E None No Power Seat 49 E are a bit awkward because of the transition from four seats across to three seats across. While you have some extra storage space, you'll have to maneuver your legs around the extra seat anchors. 49 G None No Power Seat 49 G are a bit awkward because of the transition from four seats across to three seats across. While you have some extra storage space, you'll have to maneuver your legs around the extra seat anchors. 49 H None No Power Seat 49 H is a standard Economy Class seat, although foot room and underseat storage space is limited due to the presence of an entertainment equipment box. 49 K None No Power Seat 49 K may feel cramped due to the curvature of the aircraft. 50 A None No Power Seat 50 A may feel cramped due to the curvature of the aircraft. 50 C None No Power Seat 50 C is a standard Economy Class seat, although foot room and underseat storage space is limited due to the presence of an entertainment equipment box. 50 D None No Power Seat 50 D is a standard Economy Class seat, although foot room and underseat storage space is limited due to the presence of an entertainment equipment box. 50 G None No Power Seat 50 G is a standard Economy Class seat, although foot room and underseat storage space is limited due to the presence of an entertainment equipment box. 50 H None No Power Seat 50 H is a standard Economy Class seat, although foot room and underseat storage space is limited due to the presence of an entertainment equipment box. 50 K None No Power Seat 50 K may feel cramped due to the curvature of the aircraft. 51 A None No Power Seat 51 A is in the last row of the aircraft and may have limited recline. Proximity to the lavatory and galley may be bothersome. 51 C None No Power Seat 51 C is in the last row of the aircraft and may have limited recline. Proximity to the lavatory and galley may be bothersome. Foot room and underseat storage space is limited due to the presence of an entertainment equipment box. 51 D None No Power Seat 51 D is a standard Economy Class seat, although proximity to the lavatory, galley, and rear of the aircraft may be bothersome. Foot room and underseat storage space is limited due to the presence of an entertainment equipment box. 51 E None No Power Seat 51 E is a standard Economy Class seat, although proximity to the lavatory, galley, and rear of the aircraft may be bothersome. 51 G None No Power Seat 51 G is a standard Economy Class seat, although proximity to the lavatory, galley, and rear of the aircraft may be bothersome. Foot room and underseat storage space is limited due to the presence of an entertainment equipment box. 51 H None No Power Seat 51 H is in the last row of the aircraft and may have limited recline. Proximity to the lavatory and galley may be bothersome. Foot room and underseat storage space is limited due to the presence of an entertainment equipment box. 51 K None No Power Seat 51 K is in the last row of the aircraft and may have limited recline. Proximity to the lavatory and galley may be bothersome. 52 D None No Power Seat 52 D is in the last row of the aircraft and may have limited recline. Proximity to the lavatory and galley may be bothersome. Foot room and underseat storage space is limited due to the presence of an entertainment equipment box. 52 E None No Power Seat 52 E is in the last row of the aircraft and may have limited recline. Proximity to the lavatory and galley may be bothersome. 52 G None No Power Seat 52 G is in the last row of the aircraft and may have limited recline. Proximity to the lavatory and galley may be bothersome. Foot room and underseat storage space is limited due to the presence of an entertainment equipment box. 6 A None No Power Seat 6 A is an angle lie flat seat with some extra legroom due to the bulkhead. This is a bassinet location, so passengers traveling with infants may be seated in this area. There is no floor storage during takeoff and landing. 6 C None No Power Seat 6 C is an angle lie flat seat with some extra legroom due to the bulkhead. This is a bassinet location, so passengers traveling with infants may be seated in this area. There is no floor storage during takeoff and landing. 6 D None No Power Seat 6 D is an angle lie flat seat with some extra legroom due to the bulkhead. This is a bassinet location, so passengers traveling with infants may be seated in this area. There is no floor storage during takeoff and landing. 6 G None No Power Seat 6 G is an angle lie flat seat with some extra legroom due to the bulkhead. This is a bassinet location, so passengers traveling with infants may be seated in this area. There is no floor storage during takeoff and landing. 6 H None No Power Seat 6 H is an angle lie flat seat with some extra legroom due to the bulkhead. This is a bassinet location, so passengers traveling with infants may be seated in this area. There is no floor storage during takeoff and landing. 6 K None No Power Seat 6 K is an angle lie flat seat with some extra legroom due to the bulkhead. This is a bassinet location, so passengers traveling with infants may be seated in this area. There is no floor storage during takeoff and landing. 7 A None No Power Seat 7 A is a standard angle lie flat Premium Laurel seat. 7 C None No Power Seat 7 C is a standard angle lie flat Premium Laurel seat. 7 D None No Power Seat 7 D is a standard angle lie flat Premium Laurel seat. 7 G None No Power Seat 7 G is a standard angle lie flat Premium Laurel seat. 7 H None No Power Seat 7 H is a standard angle lie flat Premium Laurel seat. 7 K None No Power Seat 7 K is a standard angle lie flat Premium Laurel seat. 8 A None No Power Seat 8 A is a standard angle lie flat Premium Laurel seat. 8 C None No Power Seat 8 C is a standard angle lie flat Premium Laurel seat. 8 D None No Power Seat 8 D is a standard angle lie flat Premium Laurel seat. 8 G None No Power Seat 8 G is a standard angle lie flat Premium Laurel seat. 8 H None No Power Seat 8 H is a standard angle lie flat Premium Laurel seat. 8 K None No Power Seat 8 K is a standard angle lie flat Premium Laurel seat. 9 A None No Power Seat 9 A is a standard angle lie flat Premium Laurel seat, although close proximity to the galley may be bothersome. 9 C None No Power Seat 9 C is a standard angle lie flat Premium Laurel seat, although close proximity to the galley may be bothersome. 9 D None No Power Seat 9 D is a standard angle lie flat Premium Laurel seat, although close proximity to the galley may be bothersome. 9 G None No Power Seat 9 G is a standard angle lie flat Premium Laurel seat, although close proximity to the galley may be bothersome. 9 H None No Power Seat 9 H is a standard angle lie flat Premium Laurel seat, although close proximity to the galley may be bothersome. 9 K None No Power Seat 9 K is a standard angle lie flat Premium Laurel seat, although close proximity to the galley may be bothersome. There is a 110v AC power outlet at every Premium Laurel Class seat. There is no power in Economy. EVA Air's A330-200 is a wide-body aircraft with a two-class configuration: Premium Laurel and Economy. 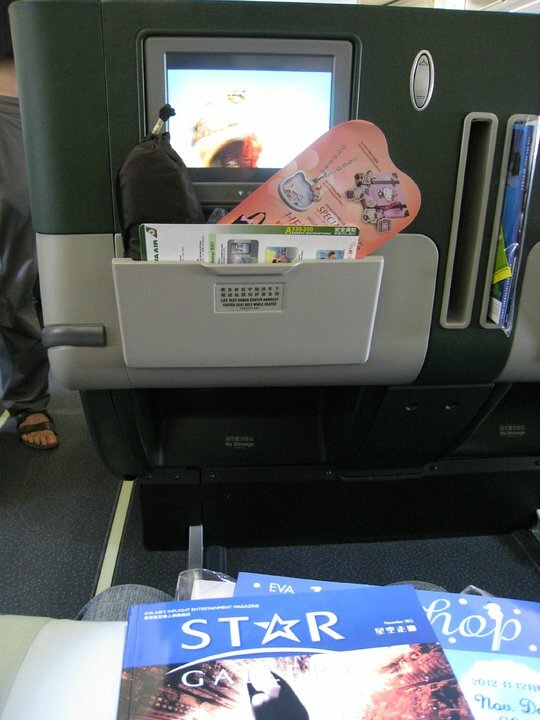 All seats are equipped with personal entertainment devices. Premium Laurel Class is configured in a 2-2-2 layout with angle lie-flat seats. 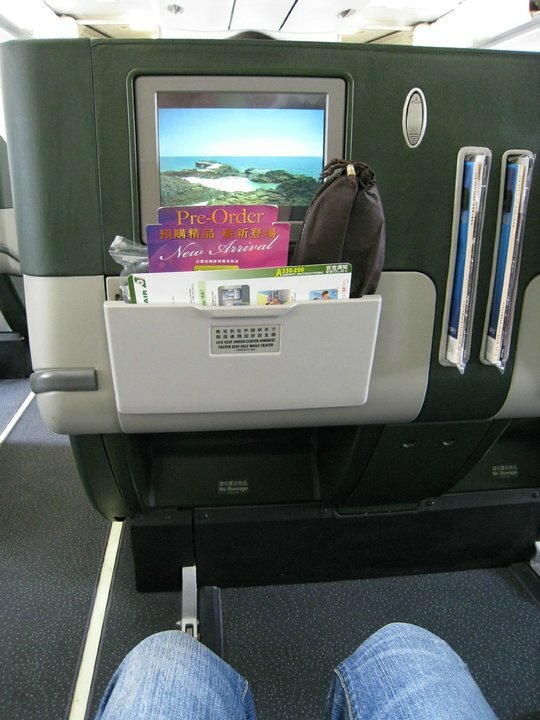 Economy Class is configured in a 2-4-2 layout. This aircraft is operated as UNI Air on select flights. This plane is very old, it isnt at par with the rest of the big airlines business class considering flight going out of asustralia is more than 8 hours. This aircraft uses a very old type of seat in BC. Very uncomfortable in sleep position and I think it's also more narrow than normal BC seats in A330 type of aircrafts. 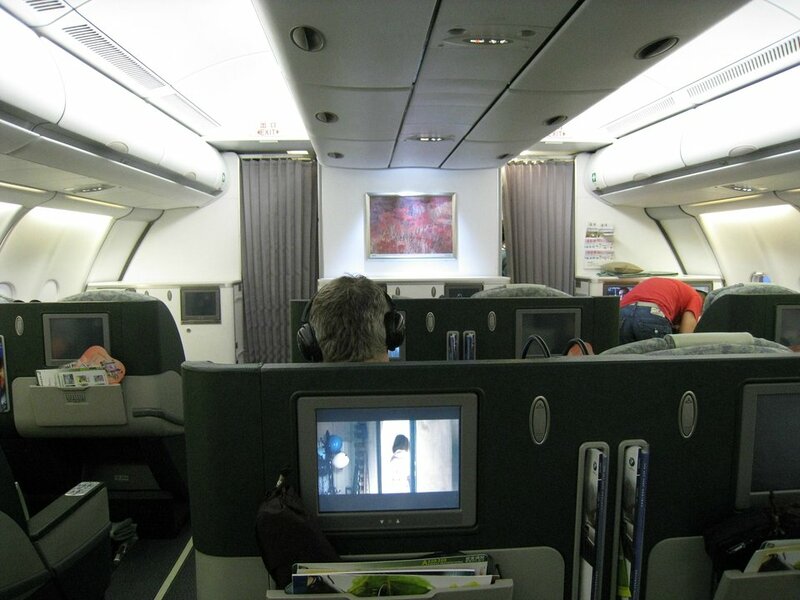 BEWARE: At least in the rear part of the economy cabin, (huge) entertainment boxes are under A,K (window) and E,F (center), NOT where they are according to the seat map. No problem if the seat next to your's is empty, otherwise bad. Try to avoid in favor of their much superior 777 where possible. All economy class aisle seats on this plane, all of them including this one, have severely limited underseat storage and legroom due to the presence of a large, metal entertainment equipment box. This is unacceptable and they need to change it. There is a IFE box blocking the space for my leg that made my 5 hours CGK to TPE very miserable as I have to bend my feet all the time. The seat is very comfortable, and there is enough room to the galley. 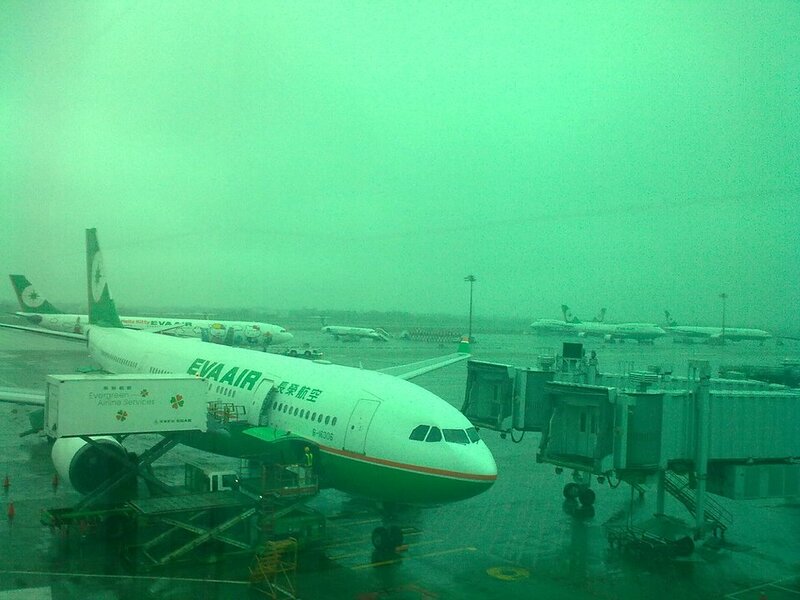 EVA Air flies 1 versions of Airbus A330-200.